The present digital guide represents one of the main outcomes of the joint work of the project consortium represented by Danish Youth Team (Denmark), OEJAB-Austrian Young Workers Movement (Austria), PROJUVEN (Spain), Alternativi International (Bulgaria), within the project “Radical Online Education”, in order to provide youth workers with updated knowledge, tools and examples of good practices in the field of preventing online radicalization. As the Internet became one of the most preferred and accessible platforms for recruiting and sharing radical ideologies, it is now more crucial than ever to promote counter narratives and equip youngsters with skills and competences in how to use critically the Internet, especially social media platforms. 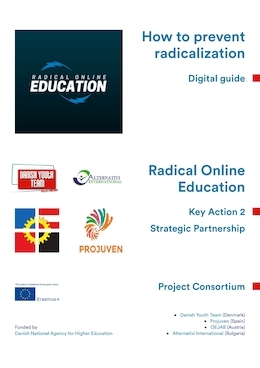 Thus, this guide gathered a useful set of guidelines, methods and case studies to be used by any youth worker interested in online de-radicalization. The guide is also available in English, Danish, Bulgarian, Spanish and German language. The first chapter offered insights into the causes of joining radical groups and the influence of digital media. Young people experiencing exclusion, disorientation or a polarized world view may be within the first with potential to be recruited by radical groups. Thus, one necessary step in preventing radicalization is to act within social work, to become more active in the field of poverty, unemployment and social exclusion, as these are the categories most targeted by radicals. The chapter went further into presenting general guidelines for taking measures and initiating projects to prevent radicalization. It gave theoretical and practical details starting from initiating and planning phases of a hypothetical preventing project up until the implementation and completion of the project. The next chapter provided direct examples of methods that could be used in preventing online radicalization within the youth work. It started by presenting the advantages of using non-formal education methods in preventing online extremism, for instance providing a balanced synergy between cognitive, emotional and practical dimensions of of learning, linking the individual and social learning while exemplifying with real-life, experimental and learning by doing activities which can be more effective when working with vulnerable groups of people. Furthermore, the chapter explained the concept of digital youth work and described different methods that could be used in preventing violent extremism, like interactive offline activities (e.g. role plays, simulation games), media literacy education, reflection/focus groups, online counselling and consultation or gaming and digital tools using apps, developing online games, online webinars, digital courses. The third chapter presented Internet and technology as tools to counter radicalization. The governments, multilateral bodies, social media companies and civil society play key roles in taking effective measures. There are several ways in which these public institutions or private companies contributed in preventing youth radicalization. Some of the examples mentioned in the chapter include the Global Internet Forum to Counter Terrorism joined by Facebook, Microsoft, Twitter and Youtube, designed to scrub terrorist recruitment material from the Internet and promote counter-narratives; the Online Civil Courage Initiative, a European initiative challenging hate speech and extremism online, founded in Berlin, by Facebook which provides online support for NGOs and activists. The guide ended with a series of case studies showing examples of good practices from around the world with people, organizations or campaigns aiming to counter and prevent extremism and radicalization. All in all, this digital guide highlights the importance of sketching a global action plan for promoting online de-radicalization and producing counter-narratives as this becomes crucial with the current rise of violent incidents linked to online radicalization. Interaction models should be used to inform and guide the process of constructing persuasive counter-narratives. For there to be success of any action plan there needs to be an exchange of experiences and an enhancing international cooperation, thus this guide could be used as a measure in this direction. KA2 CONSORTIUM "Radical Online Education"